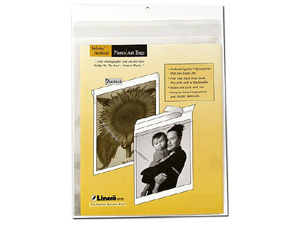 Archival quality 5x7 polypropylene bags feature a peel-and-stick flap that seals out dust and dirt. These archival quality polypropylene bags feature a peel-and-stick flap that seals out dust and dirt. Protects valuable photos, art or memorabilia from fingerprints and acidic oils. Actual Bag Dimensions: 5-3/8" x 7-1/4"
See other available sizes: Photo / Art Bags (10 pack).